From April 10, 2019 on, there will be an adjustment in China's railway operation. On the one hand, more trains will be operated. There will be new bullet types D762/3, D764/1 to open between in Lanzhou and Chengdu. One pair of high speed trains will be increased respectively between Shenyang and Jiamusi, Dalian and Qiqihar. Also, about 30 pairs of normal speed types will be increased all over the country. On the other hand, the travel time among some cities will be cut a lot. For instance, the G427/8 between Beijing West and Lanzhou West will only take about 7.5 hours at that time, about 1 hour shorter than now. The travel time between Beijing South and Qingdao North will be shortened to within 3 hours. The high speed railway connecting Lijiang and Shangri-La is expected to open by the end of 2020. Its total distance is around 139 km (86.4 mi) and there will be 13 stations along the way. The railway will pass through many scenic areas including Jade Dragon Snow Mountain, Tiger Leaping Gorge, and Haba Snow Mountain. Once it opened, the railway can not only connect the popular scenic spots, but also link with Kunming through the Kunming - Lijiang railway. The new train timetables of Lanzhou will be implemented since April 10, 2019. There will be new high speed trains to operate between Lanzhou and Chengdu East. It takes about 7 hours for a single trip and cut nearly 4 hours comparing with the travel time now. The travel time from Lanzhou West to Beijing West will also be shortened to 7.5 hours from 8.5 hours. In addition, more normal speed trains from Lanzhou to Zhangye, Jiayuguan will be operated since then. The driverless bullet trains connecting Beijing and Zhangjiakou will run by the end of 2019 and this is also the world's fastest driverless high speed train with the speed of 350 km/h (217 mph). The railway line starts from Beijing North Station, passing by Changping, Badaling Great Wall, Xuanhua and ends in Zhangjiakou. It is constructed for the 2022 Beijing Winter Olympic Games and the whole distance is 174km (108mi). Besides driverless technology, there will be intelligent robots serving in the stations along the way. Once the railway is opened, the travel time will be cut to 50 minutes. After the Chinese New Year travel rush, the first travel peak will fall on the Qingming Festival, which starts from April 5 to 7, 2019. 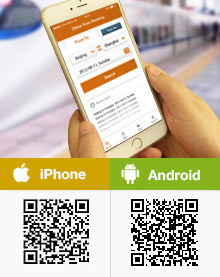 The train tickets for the festival start to be sold from March 7, 2019 and the demand of the tickets is very hot. Qingming Festival is a traditional Chinese festival for worshiping ancestors and sweeping tombs and it is also a good time for spring outing. So there will be a large travelers flow during the period. Travelers are suggested to book the tickets as early as possible. Datong - Xi'an high speed railway stretches around 859 km (533 mi) and its design speed is about 250 km/h (155 mph). The railway passes by Shuozhou, Xinzhou, Taiyuan, Jinzhong, Pingyao and Weinan, etc. The Taiyuan - Xi'an section has been opened in 2014. In 2019, the final section from Datong to Taiyuan will open around October, 2019. The whole distance of the section is around 274 km (170 mph). Once it opened, the travel time between Datong and Taiyuan will be cut to 2 hours from about 5 hours. Between Datong and Xi'an, the time will also be decreased to 5.5 hours from 16 hours. Since it has entered the return travel peak period of the Spring Festival, various cities have increased more trains for a better service to passengers. Like Guangzhou, as one of the most popular destination cities, it increases 244 trains on February 15, 2019. There are 132 high speed trains and most of trains are from Zhuzhou, Changsha to Guangzhou and Shenzhen. In Shandong Province, more 38 bullet trains will be operated between Qingdao and Jinan, Jinan and Rongcheng, Qingdao and Tengzhou. What's more, in Taiyuan city, there will be more 14 trains running to Beijing, Xi'an and Chengdu. From January 21, 2019, the Chinese Spring Festival travel rush for 2019 has started formally and it will last till March 1, 2019. During 40 days, it is expected that there will be 4,100 million passengers, with a daily average of more than 10 million. Compared with last year, there is an increase of 32 million people, with a growth of 8.3 %. 1. Open new railways. In 2018, the newly opened railways reached 4,600 km and 4,100 km of those are high speed railways. 2. 400 pairs of faster 'Fuxinghao' high speed trains will be operated during the period. 3. More temporary trains will be opened. Nevertheless, you are still suggested to book tickets in advance in case of the tickets selling out. The Wuhan - Shiyan high speed railway has entered into track-laying stage and it is expected to formally open at the end of 2019. The overall distance of the railway is 399 km (248 mi) long and the designed speed reaches at 350 km/h (217 mph). There are 13 stations setting along the way. What's more, it has been called the most beautiful railway in Hubei Province as it connects several famous scenic areas including Wudang Mountains and Yellow Crane Tower. Once the railway is open, the travel time between Wuhan and Shiyan will be cut to 2 hours and only 1 hour is needed to travel between Wuhan and Xiangyang.